When interest rates are rising, the conventional wisdom says that refinancing your mortgage is less appealing. But for some homeowners, a 15-year refinance mortgage could be a smart financial move. Shorter mortgage terms help you increase your home equity faster. They also come with lower interest rates, and you’ll pay a lot less interest over the life of the loan. Refinancing into a 15-year loan makes particular sense for homeowners who have been paying their mortgage for several years. It’s also a good option for those who have been paying extra to reduce their principal balance. In addition, homeowners who have reaped the benefit of rising home values are more likely to qualify for a 15-year loan, because they will have a lower loan-to-value ratio. According to CoreLogic, home prices increased 7.1 percent between November 2015 and 2016. They have increased 44 percent since bottoming out in March 2011. A 15-year loan typically carries a lower interest rate than a 30-year loan. For example, on January 6, 2019, one national lender quoted a refinance rate for a 30-year fixed-rate loan at 4.375 percent. That same lender offered borrowers 3.625 percent for its 15-year product. That’s a difference, or “spread,” of .75 percent — a pretty substantial difference. Why Refinance With A 15-Year Home Loan? Eliminating mortgage insurance. Private mortgage insurance (PMI) on a conventional loan can be eliminated when you have 20 percent in home equity. FHA mortgage insurance premiums continue for the life of the loan (since June 3, 2013). Dumping $150 or more in mortgage insurance can make a 15-year loan affordable. Using your home equity for home improvements. A cash-out 15-year refinance can be used to make home improvements that may increase the value of your house as well as its livability. At the same time, the shorter loan term means you can build equity even faster. Consolidating credit card debt. Paying off your credit card can be a good use of the funds from a cash-out refinance, particularly when this is coupled with a shorter loan term. Within 15 years, you could be completely debt-free. Consolidating mortgage debt. Rising interest rates and the end of the initial interest-only phase of a home equity line of credit (HELOC) could mean a spike in your payments. With enough equity, you may be able to wrap your HELOC or home equity loan into one mortgage with a 15-year term. Interest rates on 15-year fixed loans are usually lower than home equity rates, and they won’t increase. Preparing to retire. One of the most common reasons for a 15-year refinance is to manage your retirement timeline. Many homeowners want to own their home without a mortgage in retirement. Other goals include selling their current home with sufficient equity to be able to pay cash for a retirement property. While 15-year home loans clear your mortgage debt in half the time, you won’t be doubling your payment to achieve this. The chart below shows how a five-year-old loan might look if you refinance at today’s 15-year rates. Depending on your individual circumstances, refinancing into a 15-year mortgage could result in the same or even lower principal and interest payments. 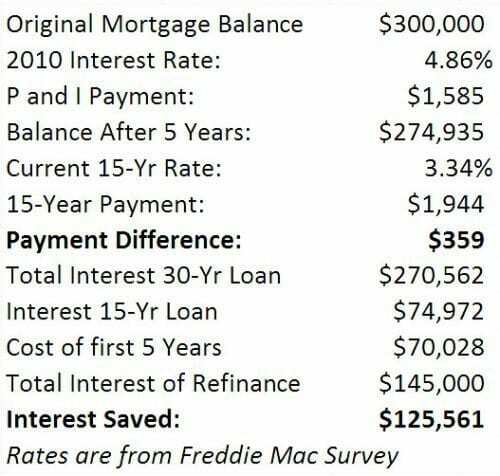 If your lower balance and better interest rate offsets the reduced loan term. In many cases, though, the shorter loan term means your payments will be higher. Even so, a 15-year refinance could make sense financially. If a 15-year refinance doesn’t fit your budget, you can always consider refinancing into a 20 or 30-year loan and making higher payments to eliminate your mortgage faster and reduce the amount of interest you pay. This method provides flexibility that may be a better financial option for some homeowners. Today’s 15-year and 30-year mortgage rates have dropped for three straight weeks, according to Freddie Mac. The “spread between 30 and 15-year loans is always a consideration when you choose a refinance loan.